Juventus secured their third straight Italian title as nearest rivals Roma suffered a shock defeat at Catania. Needing a win to keep their slim hopes alive, Roma fell 2-0 behind through captain Mariano Izco's quickfire double for Serie A's bottom side. 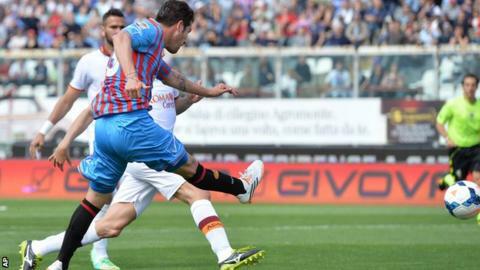 Roma skipper Francesco Totti halved the deficit before half-time, but Gonzalo Bergessio and Pablo Barrientos clinched Catania's win after the break. Defeat leaves Roma eight points behind Juventus with two matches remaining. Now Antonio Conte's men will celebrate their Scudetto success with a title-winning party in their home match against Atalanta on Monday. Match ends, Catania 4, Roma 1. Second Half ends, Catania 4, Roma 1. Attempt missed. Dodô (Roma) left footed shot from the centre of the box is close, but misses to the left. Assisted by Daniele De Rossi with a through ball. Attempt saved. Gonzalo Bergessio (Catania) left footed shot from the centre of the box is saved in the bottom right corner. Assisted by Jaroslav Plasil with a cross. Corner, Catania. Conceded by Morgan De Sanctis. Attempt saved. Gonzalo Bergessio (Catania) right footed shot from the centre of the box is saved in the top centre of the goal. Assisted by Jaroslav Plasil. Substitution, Catania. Francesco Lodi replaces Fabián Rinaudo. Alessio Romagnoli (Roma) wins a free kick in the defensive half. Foul by Gino Peruzzi (Catania). Francesco Totti (Roma) is shown the yellow card. Foul by Fabián Rinaudo (Catania). Miralem Pjanic (Roma) is shown the yellow card. Corner, Roma. Conceded by Cristiano Biraghi. Substitution, Catania. Cristiano Biraghi replaces Lucas Castro. Corner, Roma. Conceded by Alexis Rolín. Attempt missed. Michel Bastos (Roma) left footed shot from long range on the left misses to the right. Goal! Catania 4, Roma 1. Pablo Barrientos (Catania) left footed shot from outside the box to the bottom right corner. Assisted by Mariano Izco. Delay in match Pablo Barrientos (Catania) because of an injury. Foul by Mehdi Benatia (Roma). Pablo Barrientos (Catania) wins a free kick in the defensive half. Attempt missed. Francesco Totti (Roma) header from the centre of the box misses to the right. Assisted by Maicon with a cross. Attempt missed. Norbert Gyömbér (Catania) header from the centre of the box is close, but misses to the left. Assisted by Pablo Barrientos with a cross following a corner. Corner, Catania. Conceded by Alessio Romagnoli. Gervinho (Roma) wins a free kick on the right wing. Foul by Fabián Monzón (Catania). Attempt missed. Maicon (Roma) right footed shot from outside the box misses to the left. Assisted by Michel Bastos with a cross following a corner. Corner, Roma. Conceded by Alberto Frison. Attempt saved. Michel Bastos (Roma) left footed shot from outside the box is saved in the bottom right corner. Assisted by Maicon. Fabián Rinaudo (Catania) wins a free kick in the defensive half. Substitution, Catania. Jaroslav Plasil replaces Sebastián Leto. Delay in match Lucas Castro (Catania) because of an injury. Foul by Mariano Izco (Catania). Offside, Roma. Michel Bastos tries a through ball, but Mehdi Benatia is caught offside. Gervinho (Roma) is shown the yellow card.